Set oven to 350* or Mark 4. Mix the flour with the salt and pepper. Coat the beef slices with seasoned flour. Melt the butter in a frying pan. Fry the collops for about 2 minutes on each side. Remove from the pan and set aside. Gently fry the onion and the mushrooms. Put the onion and mushrooms and a bayleaf (if desired) into a casserole. Lay the collops on top. Pour in the stock, cover and cook for 1 1/2 hours. Serve with buttered mashed potatoes and a green vegetable. Rowan or redcurrant jelly goes well with this dish. Serves 4. This is before I added the beef stock. I did use a bayleaf. I would cook it for a half hour more next time. Love the art work! Finished product. We didn’t have a green vegetable though, a rather bland looking plate but it was delicious! The flavor was fantastic, I could have licked my plate! Toast the oatmeal in a pan under a hot grill until golden. Set aside to cool. Put the cream, honey and whisky in a bowl and whip together until it forms peaks. Fold in the yoghurt. Spoon the mixture into a serving dish and chill in the refrigerator for 2-3 hours. Before serving, sprinkle the oatmeal over the mixture and pile the raspberries in the centre. Serves 6. Ideally Cranachan should be made with Crowd, a soft Scottish cheese but yoghurt makes a good substitute. This wasn’t sweet enough for Bossman’s American tastebuds, but I loved it. As the 14th century dawns, Scotland’s survival hangs by a spider’s thread. While the Scot clans scrap over their empty throne, the brutal Edward Longshanks of England invades the weakened northern kingdom, scheming to annex it to his realm. The beleaguered Scots cherish and lionize James Douglas as their “Good Sir James.” Yet in England, his slashing and elusive raids deep into Yorkshire and Northumbria wreak such havoc and terror that he is branded the Black Douglas with a reward placed on his head for his capture. As a boy, James falls in love with the ravishing Isabelle MacDuff, whose clan for centuries has inaugurated Scottish monarchs on the hallowed Stone of Destiny. His world is upturned when he befriends Robert Bruce, a bitter enemy of the MacDuffs. Forced to choose between love and clan loyalty, James and Isabelle make fateful decisions that will draw the opposing armies to the bloody field of Bannockburn. Isabelle will crown a king. James will carry a king’s heart. At last, both now take their rightful places with Robert Bruce, Rob Roy, and William Wallace in the pantheon of Scot heroes. Here is the story of Scotland’s War of Independence and the remarkable events that followed the execution of Wallace, whose legend was portrayed in the movie Braveheart. This thrilling epic leads us to the miraculous Stone of Destiny, to the famous Spider in the Cave, to the excommunicated Knights Templar, to the suppressed Culdee Church, and to the unprecedented Declaration of Arbroath, the stirring oath document that inspired the American Declaration of Independence four hundred years later. The Spider and the Stone is the unforgettable saga of the star-crossed love, religious intrigue, and heroic sacrifice that saved Scotland during its time of greatest peril. This book was recently brought to my attention and since it fits right in with our Read Scotland Challenge I thought I would share it with you! It looks really good! I know your probably saying ‘Yes, but I’ll never get it read by the end of the year’, BUT Read Scotland will be back for a 2015 edition so go ahead and get it! Stay tuned for a review! Click here for links to buy the book. Here are a couple links to get your interested in the subject matter! 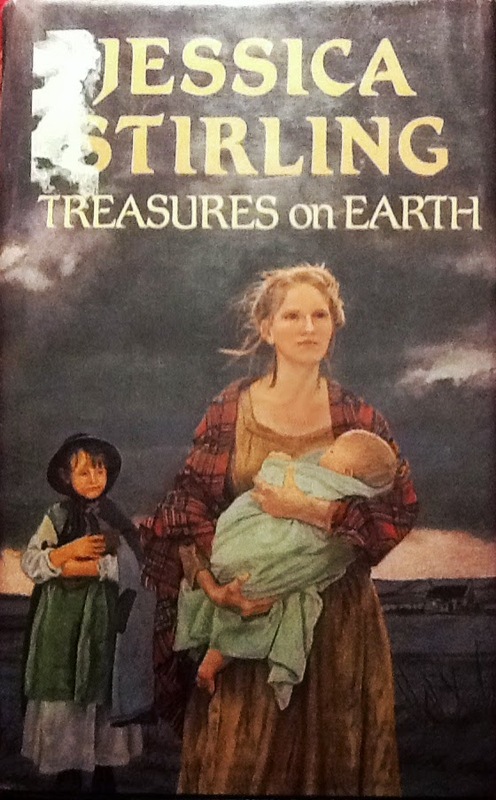 Treasures on Earth is the story of the indomitable Gaddy Patterson, a Scotswoman who struggles to raise her daughters amid the harsh realities of nineteenth-century Scottish rural life. Gaddy Patterson stumbles upon a dead girl and her infant daughter in a sheep hut in Balnesmoor, a staid lowland parish. Gaddy saves the baby’s life and decides to rent a tiny patch of ground – Nettleburn – on which she can scrape together a life for them both. However, the suspicion and hostility of the villagers towards Elspeth, the adopted daughter, forces Gaddy to return to her initial life as a wandering cattle dealer. Homeless and desperate, she takes up with Coll Cochran, a farmer dogged by ill-fortune, and by his disturbed wife, Etta. To Coll, Gaddy brings both luck and love in equal measure. But the mystery of Elspeth’s true identity looms larger when Gaddy gives birth to a daughter, Anna. The scandal and ensuing tragedy that haunt Gaddy and her daughters, along with the close bonds of love and family dignity that help them endure, are the mixed treasures of this richly engrossing novel. In Treasures on Earth Jessica Stirling captures the brooding beauty and the gallery of colorful characters that make up Scotland. I loved this tale! Great characters making a life in a raw brutal landscape. Set between 1791 and 1811. Gaddy is 40 years old when our story starts. She is a cattle drover’s helper. Often referred to as his ‘second wife’, she travels with Donald McIvor when he is on the road droving. I found the droving lifestyle interesting, nomadic. Gaddy is a strong woman both physically and emotionally. She stands up to the pious townspeople and the church. She lets no one ‘steal’ her God-given freedom in an era when women had no freedom. She sees herself as equal and works as hard as any man. I admired Gaddy. The church in this era was so self-righteous and the story is full of self-righteous people. Once some of the women even threw stones at Gaddy as she and her daughter, Elspeth, walked down the street. It saddens me when I read tales like this and it is so prevalent in this era in the Presbyterian church of Scotland. But Rev. Leggat was a loving and progressive minister and fought his pious elders at every turn. The weather is never their friend and they are at its mercy earning a living off the land. Near the end of the book there is an unusually hot summer and drought ending with torrential rains coming down in one day destroying everything they’ve worked so hard for. I looked around online and found that in 1811 there was a drought and then torrential rains in one day that caused catastrophic flooding. It happened on November 1st. This one day forever changed the course of Gaddy and her daughters lives. Will James Moody, Gaddy and Coll’s worst enemy, be the only one Elspeth can turn too for help? Will he be her saviour or destroy her? You’ll only know if you read it! I’ll tell you this…after reading almost 400 pages of a great story I was left stunned with the last couple paragraphs! I laid awake thinking of the ramifications of what happened. I can’t wait to read book 2 now! If your interested in reading about the drovers lifestyle here‘s a great article about Scottish Cattle Drovers. Hope you are able to find this book to read! This makes number 13 for me in the Read Scotland 2014 challenge! I climbed Ben Nevis! Now onto greater heights! 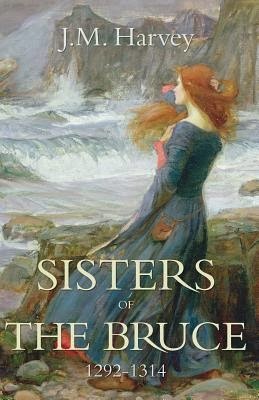 ‘Set against the wild and perilous background of Scotland in the late 13th century, the adventurous lives of Robert the Bruce’s five sisters come to life through their own words in a series of letters. Courage and tenacity are often associated with Scotland’s great hero, but few appreciate the enormous challenges experienced by these remarkable sisters. Their intimate account of family life resonates still with love, loss and hope. Isa leaves home to sail to the land of the Vikings to become Queen of Norway whilst her sister, Kirsty, finds herself Countess of Mar and chatelaine of the great Kildrummy Castle in Scotland’s far northeast. Danger looms and the younger sisters, Mathilda and Margaret, escape to Orkney with Kirsty’s children. This historical fiction novel is told through letters between siblings Isa and Kirsty with an occasional letter from brother Robert thrown in for the first part of the book. The latter part is third person narrative. Although the author obviously did great research and all the details are there it just didn’t pop for me. Written as a historical fiction, it read more like a historical non-fiction as it just didn’t have the ‘novel’ feel about. I couldn’t get invested in the characters or the storyline. It was a little flat. Actually by the second half I was skimming just to get done. It’s a lengthy book at 496 pages. We do get a glimpse of the history of Norway as well as Scotland through letters from Isa Bruce who became Queen of Norway. The medieval world was describe quite well. I would say if you like history this is a good book if you go into it not looking for a ‘novel’ you will connect with the characters in, but more as a well researched historical record. 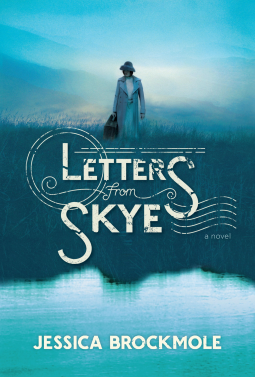 A sweeping story told in letters, spanning two continents and two world wars, This atmospheric debut novel captures the indelible ways that people fall in love, and celebrates the power of the written word to stir the heart. I loved this book! Read it in 2 days. I enjoyed the letter format. It bounced back and forth between the letters written during the first world war between lovers and the letters written during the second world war between daughter and several people as she looked for her missing mom and tried to figure out what secret the past held. At the same time I was angry with Elspeth for cheating and admired her courage to go after what she wanted. You can’t just hurt other people like that and get a charmed life or did she get a charmed life? Just when you thought you had the end figured out a surprise turns up! Now just who’s daughter is Margaret anyway? The descriptions of Skye made me feel like I was there and the descriptions of the war raining down on them were very real too. It’s a book that makes you feel wistful afterwards and leaves you feeling like you know these people, after all you read their intimate letters. It was no impulsive war marriage. Elspeth was married to my best mate, Iain. The three of us had grown up on the hills of Skye. We ran bare-legged down the braes, splashed along the shingle in search of stones. Truth be told, Iain was always a little afraid of Elspeth. Her hair wild, she’d shout poems into the ocean spray. She was as fey as the island. One day we were dangling over the Fairy Bridge and he asked for her hand. She looked at me, then smiled and said yes. I thought the three of us would always be together. I never thought Elspeth would betray him. As much as I’d like to help, I don’t have the answers. I left Skye about a year before you were born. But my mathair, she was there. Write to her on Skye. Your grandmother will know more than I do. If you love Scotland, romance and a bit of mystery this book is for you! I will be looking forward to more from this author!